On the twelfth day of Geekmas, teflgeek gave to me: 12 blogs worth clutching. Welcome to the teflgeek Christmas celebration! Themed around the classic Christmas carol – but going backwards, mostly because it’s more like a countdown that way! So – 12 blogs worth holding onto. Actually this ties into the Edublog awards, for which nominations are currently open (but which close Friday 2nd December). So technically, not all of these are blogs as it also relates to twitter, wikis and other categories. Best individual blog: I think it has to be Larry Ferlazzo. 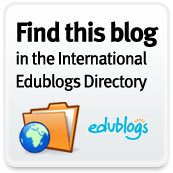 His blog should be the first port of call for anyone thinking about anything related to ELT – somewhere on Larry’s site there will be a post about it. His prolific output is such that you begin to imagine he isn’t really a teacher in Sacremento at all, but is actually three retired ladies called Doris from Inverness. Best individual tweeter: A difficult one to answer as there are so many people who could rightfully walk away with that title. I will though, go with @brad5patterson. Best new blog: new to me at any rate: Tyson Seburn’s 4c. Go read it. Best ed tech / resource sharing blog:Free Technology for teachers. Richard Byrne’s blog is THE place to go for the tech minded teacher. Most influential blog post: Marisa Constantinides’ Disability Awareness Blog Challenge. Best twitter hashtag: has to be #ELTchat. Best free web tool: Wordle. I use it more than any other web tool out there. For interesting jumbled handouts it can’t be beaten. Best educational use of audio / video / visual / podcast:Kieran Donaghy’s Film English. An excellent, interesting and motivating series of videos with accompanying lesson plans. Best educational wiki: The teflworldwiki – an excellent resource of ideas and reference material. Best educational use of a social network: The British Council’s Teaching English Facebook page. 37,000+ people can’t be wrong! Lifetime achievement: Though I’m not sure he’ll welcome the inference of the “lifetime achievement”: Scott Thornbury. Thanks so much for the nomination, I’m really honoured. No thanks necessary! I’ve been very impressed by everything I’ve seen on your blog – I think you deserve some recognition! Many thanks, David. This is a challenge very dear to my heart and you did more than your share in supporting it and in showing that ELT teachers can make a difference. I don’t know that my post deserves such an honour but the cause behind it certainly does and I want to thank you very much. I felt that of all the blog posts I read this year, yours was the one that prompted the greatest response, and as such, for me at least it fell under the heading of most influential. Disability awareness is something that I think most “not yet disabled” people (the phrase comes from a Radio 4 podcast: http://www.bbc.co.uk/programmes/b0174gl1 ) ignore, and yet it’s something we’ll all have to face up to eventually! It was a post that made me think, and a post that inspired me to write. So, i think on balance that makes it worthy! Many thanks for nominating the TeachingEnglish Facebook page – very nice to get this public recognition. P.S Think your Twelve Days of Geekmas series are real gems! Just going to link to them on the page. recognition = ooh that looks good! Well deserved and good luck in the voting! Thank you so much for nominating 4C here! =) Unfortunately (for me), I renamed a previous blog in August and it doesn’t look like that qualified me for a nomination in this category. Sorry about that – I guess the newness to nominator ratio was off. Next year I’ll put you in for the lifetime achievement award…. Completely forgot about all that in 2012! Been dissertationing over Xmas and have only just been liberated. (ab)normal service to be resumed shortly … Tell you what, I’ll set up my own awards system and you can have the lot!